Four-color process printed on Side 1 of 12pt C1S White Semi-Gloss stock coated with Aqueous Gloss. H2 business card slits on left pocket. 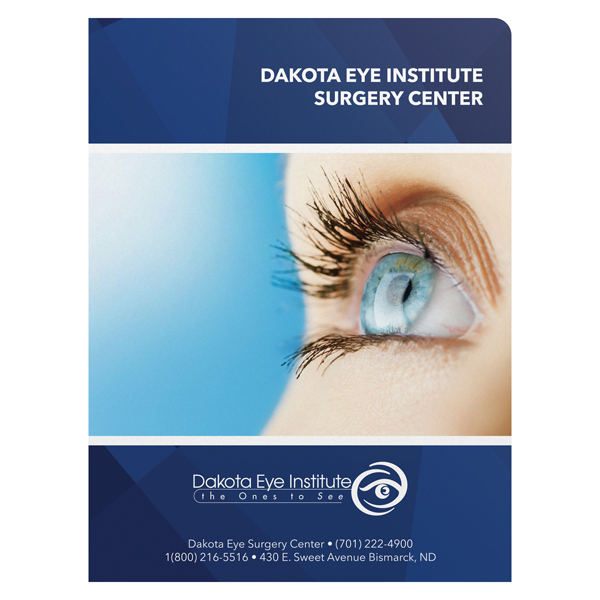 Dakota Eye Institute's blue and white color scheme evokes feelings of security and calmness for patients. Its logo looks like an eye inside a circle, which represents the relationship between the surgery center and its patients. The sans serif font adds a modern element to the design. Notes to patients are inside on the left pocketm along with the surgery center's contact information. A service list is on the back with location information. Four-color process printed on Side 1 of 12pt C2S White Semi-Gloss stock coated with Aqueous Gloss. H1 business card slits on right pocket. 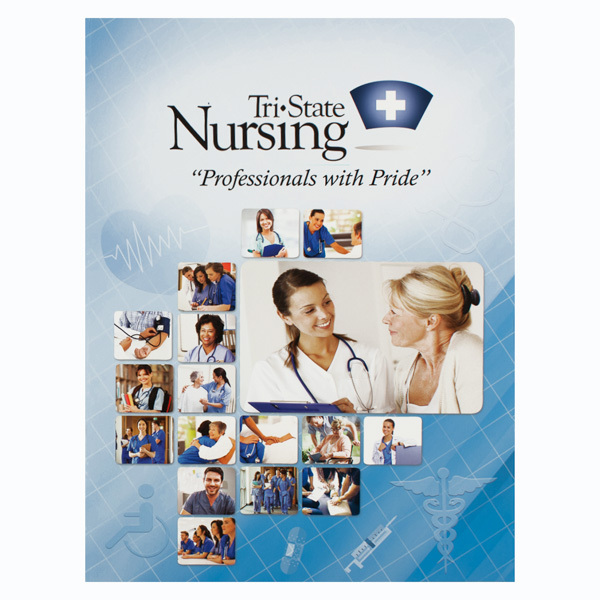 Tri-State Nursing shows it is a company people can trust with its folder design. Hard-working, happy nurses are on the cover against a blue background with medical symbols throughout. Inside, the calming blue background continues onto the pockets. More happy nurse images are on the right pocket, along with the benefits of working for Tri-State Nursing. The company's contact information is on the back. Side 1 printed with 1 PMS color using heavy coverage. 80lb White Smooth stock uncoated. H1 business card slits on left pocket. 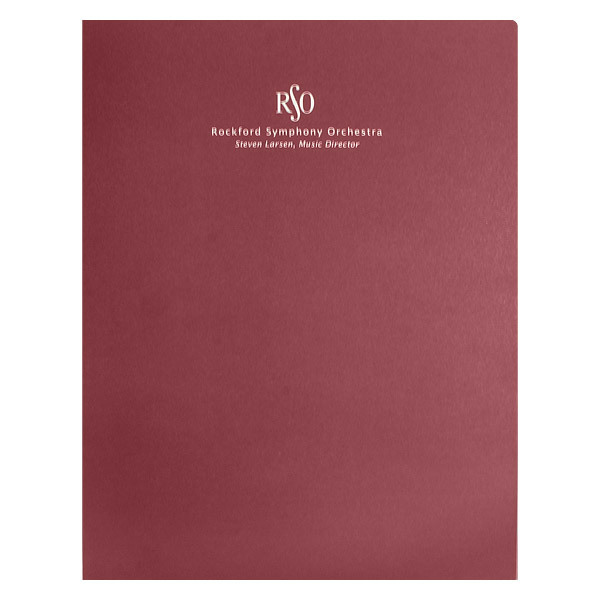 A diluted red cover portrays hushed tones of passion and energy, perfect for the Rockford Symphony Orchestra's robust musical ensembles. The background's color also gives the group a uniform look, as all of the musicians carry the same elegant, simple design across the performing stage at a high-end concert hall. Two interior pockets put a lighthearted spin on the stately design and add a spark of entertainment for the orchestra's members. Word art forms a wall of world-famous composers, inspiring the musicians to play with the gusto of the classical greats. 1 PMS color printed on Side 1 of uncoated 80lb Leaf Green Vellum stock. H1 business card slits on left pocket. Vibrant leaf green stock breaks away from the typical dull accounting designs to capture the verdant look of the lush countryside in Smyth and Ward's native Pennsylvania. 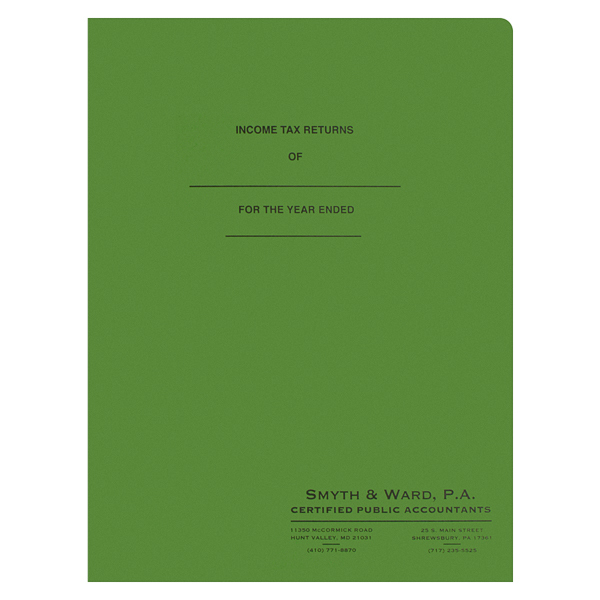 Blank lines at the top of the cover let accountants write in each client's information, while contact info in the bottom left corner is easily accessible for customers who have questions about their income tax returns. What looks like two standard pockets is actually one continuous pocket spanning both interior panels. Because it's connected in the center, the continuous pocket prevents 8 1/2" x 11" print materials from slipping or sliding toward the middle. A relief slit in the center of the pocket creates the illusion of two separate pieces. The pocket is also the perfect place to put a wide design, such as a panoramic photo, stylish pattern, or other artistic elements.